Mayo 3-3 Tipperary 0-4 (St Tiernan’s Park, Crossmolina, 18/1/1970). MAYO: E Rooney; S Hughes, R Prendergast, R Niland; J Carey, J Morley, J Earley; PJ Loftus, J Langan; T Fitzgerald, J Gibbons, J Corcoran (1-2); J Nealon, W McGee (2-0), S O’Dowd (0-1). Subs: JJ Cribben for O’Dowd, D Griffith for Langan. Kerry 0-12 Mayo 0-4 (Austin Stack Park, Tralee, 1/2/1970). MAYO: E Rooney; S Hughes, R Prendergast, J Earley; J Carey, J Morley, J Burke; PJ Loftus, J Langan; T Fitzgerald (0-1), J Gibbons, J Corcoran (0-1, free); J Nealon, W McGee, S O’Dowd (0-2, frees). Subs: D Griffith for O’Dowd, S O’Grady for Loftus. DIVISION III SEMI-FINAL: Mayo 3-11 Clare 0-5 (Pearse Stadium, 22/3/1970). MAYO: E Rooney; S Hughes, R Prendergast, J Burke; J Carey, J Morley, J Earley; J Langan (1-0), PJ Loftus; T Fitzgerald, J Gibbons (0-1), J Corcoran (1-7); J Nealon, W McGee (0-1), S O’Dowd. Sub: JJ Cribben (1-2) for Nealon. DIVISION III FINAL: Mayo 0-10 Kerry 1-5 (Pearse Stadium, 12/4/1970). MAYO: E Rooney; S Hughes, R Prendergast, R Niland; J Carey, J Morley, J Earley; PJ Loftus, J Langan (0-1); T Fitzgerald, J Gibbons (0-1), J Corcoran (0-6, four frees); JJ Cribben (0-1), W McGee (0-1), D Griffith. Subs: S O’Grady for Loftus, J Nealon for McGee. NFL SEMI-FINAL: Mayo 1-11 Derry 2-7 (Croke Park, 19/4/1970). MAYO: E Rooney; S Hughes, R Prendergast, R Niland; J Carey, J Morley, J Earley; PJ Loftus, J Langan; T Fitzgerald, J Gibbons (1-2), J Corcoran (0-7, four frees); D Griffith (0-2), W McGee, JJ Cribben. NFL FINAL: Mayo 4-7 Down 0-10 (Croke Park, 10/5/1970). MAYO: E Rooney; S Hughes, R Prendergast, R Niland; J Carey, J Morley, J Earley; PJ Loftus, J Langan (0-1); T Fitzgerald (1-0), J Gibbons (1-0), J Corcoran (0-4); D Griffith, W McGee (0-1), JJ Cribben (2-1). Sub: S O’Grady for Loftus. SEMI-FINAL: Roscommon 2-10 Mayo 1-9 (Tuam Stadium, 22/6/1970). MAYO: E Rooney; G Nevin, R Prendergast, R Niland; J Carey, J Morley, J Earley; PJ Loftus, J Langan; T Fitzgerald, J Gibbons (1-0), J Corcoran (0-6, five frees); D Griffith (0-1), W McGee (0-1), S O’Dowd (0-1). Subs: S O’Grady for Loftus, B O’Reilly for Earley. Antrim 1-5 Mayo 2-5 (Casement Park, 18/10/1970). MAYO: E Rooney; S Hughes, R Prendergast, R Niland; J Carey, J Morley, B O’Reilly; S Kilbride, J Langan; T Fitzgerald, J Corcoran (1-1), D Griffith; J Nealon (0-1); W McGee, JJ Cribben (1-3). Mayo 2-12 Cavan 1-9 (St Tiernan’s Park, Crossmolina, 1/11/1970). ). MAYO: E Rooney; S Hughes, R Prendergast, P Ward; J Carey, J Morley, B O’Reilly; J Langan, S Kilbride (0-1); T Fitzgerald (0-1), D Griffith, J Corcoran (0-4); J Nealon, JJ Cribben (1-5), T O’Malley (0-1). Subs: R Niland for Ward, W McGee (1-0) for Griffith. Mayo 2-2 Derry 2-14 (MacHale Park, 29/11/1970). MAYO: E Rooney; S Hughes, R Prendergast, R Niland; J Carey, J Morley, B O’Reilly; S O’Grady, J Langan; ; T Fitzgerald, S Kilbride, J Corcoran (0-1); D Griffith (1-0), W McGee (0-1), J Nealon (1-0). Sub: T O’Malley for Kilbride. SEMI-FINAL: Mayo 1-8 Galway 0-5 (Claremorris, 3/5/1970). 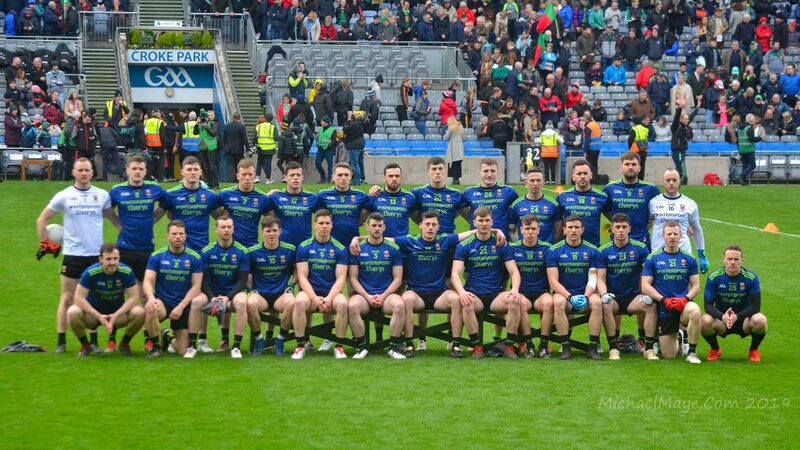 MAYO: J Foody; S Hughes, D O’Mahony, P Warde; G Nevin, J Lynott, B O’Reilly; S O’Grady (0-1), D Dolan; T O’Malley (0-2), S Kilbride (0-1), D Griffith (1-3); M McIntyre, A Kelly, T Holland (0-1). FINAL: Roscommon 1-10 Mayo 0-14 (Roscommon, 19/7/1970). MAYO: S Cosgrove; K Mahon, D O’Mahony, P Warde; G Nevin, J Lynott, B O’Reilly (0-1); S Kilbride (0-3, two frees), D Dolan; T O’Malley (0-2), S O’Grady, D Griffith (0-1); T Lally (0-1), F Burns (0-1), M McIntyre (0-4, frees). Subs: W Henry (0-1) for Dolan, M Sweeney for Lally. SEMI-FINAL: Mayo 1-13 Cork 1-15 (MacHale Park, 30/8/1970). MAYO: S Cosgrove; S Hughes, D O’Mahony, P Warde; G Nevin, J Lynott, B O’Reilly (0-1); S O’Grady, D Dolan (0-2); T O’Malley (0-1), S Kilbride, D Griffith (1-3); M McIntyre (0-1), T Holland (0-5), W Henry. Subs: F Burns for Henry, M Sweeney for Dolan. SEMI-FINAL: Mayo 3-8 Roscommon 2-5 (Pearse Stadium, 12/7/1970). MAYO: C Rooney; J O’Mahony, J Duggan, J Costello; G Conroy, B McGrath, J Culkin; N McCarthy (0-1), C Moynihan; T Moran (0-4), V Kelly (1-0), K Kenny (1-0); N Joyce (1-0), R McNicholas (0-1), J Dillon (0-2). Sub: K Heneghan for Dillon. FINAL: Galway 2-11 Mayo 1-6 (Tuam Stadium, 26/7/1970). MAYO: C Rooney; J O’Mahony, J Duggan, J Costello; M McNeela, B McGrath, J Culkin; C Moynihan (0-2), N McCarthy; T Moran (0-3), V Kelly (1-0), K Kenny (0-1); N Joyce, R McNicholas, K Fallon. Subs: G Conroy for McNeela, K Heneghan for Joyce, N Forde for McNicholas.